His own future may still be unclear, but Jordan Fulton has played a key role in Fife Flyers’ latest new signing. American forward Michael Dorr was this week confirmed as Flyers sixth summer signing following a glowing recommendation from his fellow countryman. The pair crossed paths during their university days in Minnesota, and Fulton’s high opinion of the player helped convince Flyers to make their move. Todd Dutiaume, Flyers head coach, confirmed: “What first drew our attention to Michael was the fact he came highly recommended through Jordan Fulton. “Jordan played against him in his younger years and couldn’t say enough about him. “Players and past players are often your best recruiters. Whether or not Fulton returns to Fife next season remains to be seen, but Dorr joins the Flyers following stints in the ECHL, DEL2 and Germany 3. The 26-year-old right-hander finished the 2013/14 season as second top goal scorer in the DEL2, with 32 goals from 51 games for EC Bad Nauheim, although he has spent the past year recuperating from ankle surgery. “He had an injury last season but he’s fully recovered,” Dutiaume said. “We’re hoping he can put up the kind of numbers he did in Germany but be a complete player for us. “It’s not the players’ fault that they get hurt but we have to do our due diligence to make sure that guys are healthy. “We rely heavily on our imports so we need them to be healthy, and we’re assured that he’s fit and ready to go. “Guys can go two ways when they get injured – they can either retire or decide to come back. Flyers have also confirmed the return of Blair Daly as back-up netminder, although Dutiaume is looking for the 27-year-old to rediscover his confidence after a challenging season. “Last season Blair resigned himself to just being a back-up which affected the mental side of his game, and he lost a bit of confidence,” he said. “You seen his confidence grow when we put him back into that starting sport when the Romanians came to visit and the crowd really got behind him. “Goaltenders are not immune to injuries, so we have to be able to rely on Blair to step into that position if required. “If the schedule gets hectic we’ll also need Blair to log some minutes to give some rest import goalie. “It’s something he’s quite capable of. “He came to us and said he feels in his prime, he insists that he’s highly motivated, and that he wants to be part of this organisation. Daly will not be providing back-up to Kevin Regan next season after the import netminder, who won back to back Mirror of Merit titles in his two seasons with Flyers, confirmed his intention to retire from the sport via an online blog. “Kevin gave us plenty notice out of mutual respect for each other,” Dutiaume said. “We loved the job he did for us over the last couple of seasons. “At times we didn’t perform our best in front of him which may not have reflected on him as well as we’d have liked, because there’s a good possibility that we had the best goaltender in the league. “We’re sad to see him go but he’s thinking of his family. He was a class act on and off the ice and we’ll stay in touch. Another player not returning to Fife is Bobby Chaumont, who has moved across the Tay to rivals Dundee Stars to take up a position as player-assistant coach. 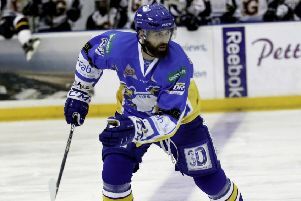 The forward made 156 appearances for Flyers, averaging over 1.23 points per game. “Bobby always expressed an interest in coaching but we don’t have any room on our coaching staff for that,” Dutiaume said. “It’s an unbelievable opportunity for Bobby at this point in his career and we wish him all the best. “I consider Bobby a good friend - he was one of my favourite guys to have in the room - and he performed well for us. “What he has done for the club as far as putting points up is undeniable.